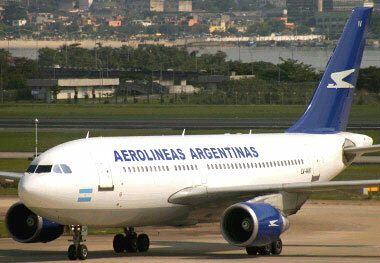 Aerolineas Argentinas Airlines is the national airline carrier of Argentina. It is recognised as Argentina's largest domestic and international airline carrier with main hubs located at Ministro Pistarini International Airport and Jorge Newbery Domestic Airport. Founded in the year 1929, the airline company's headquarters is located at the capital cify of Argentina, Buenos Aires. During the early days, Aerolineas Argentinas only served 2 destinations, Mendoza and Posadas. A merger was formed between Aerolíneas and a domestic carrier, Austral. Besides being the longest serving operator of the Boeing 737-200, Aerolineas Argentinas also is the only Latin American carrier that flies to Oceania. Aerolineas Argentinas frequent flyer program is called Aerolíneas Plus and its catering service is known as the Gate Gourmet with headquarters in Zurich, Switzerland, and Reston in unincorporated Fairfax County, Virginia, United States.